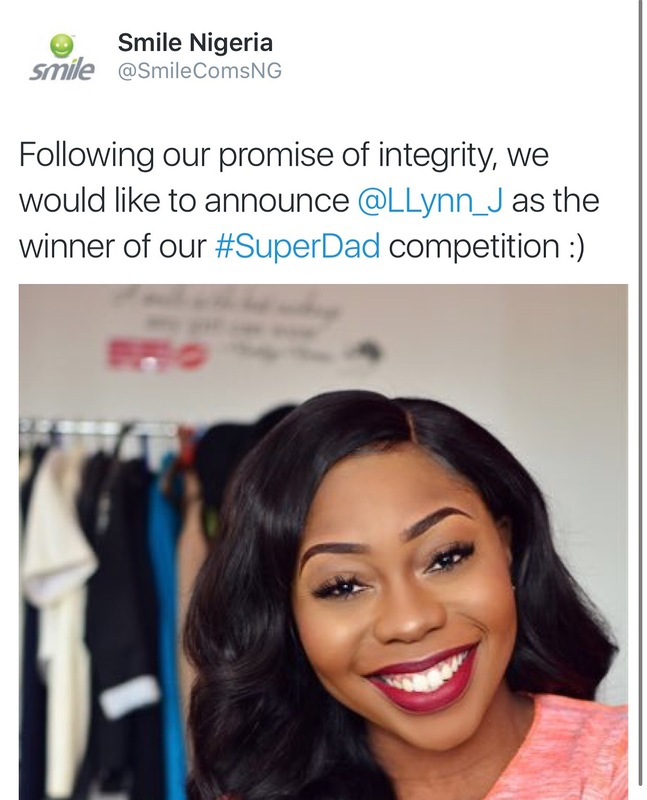 I’m sure you all got blog updates about this competition I participated in, #SUPERDAD contest organised by smile communications NG. An internet service provider in Nigeria. I’m glad to announce that I was declared the winner yesterday and I am grateful. It was a twitter held Father’s day contest where people got a chance to win prizes for themselves and their Dads to mark this special day. I was just online when I saw the competition being announced. I promptly entered not just because I’m a bona-fide Daddy’s girl who felt it would be awesome to win the prize- Two modems(mobile routers) and Free data for myself and my Dad) but also because majority of my work is done online, and this was a good opportunity get a mobile dongle and data for free. The one I had was a table top, so it’s not so great for out-of-home uses. Participating was so intense for the two days it ran. I had 3 other major players and it took a lot of hard work to get on. Although, winning did not come easy. Smile NG put us under so much pressure & suspense, but looking back that made it fun. There were also some underlying issues with declaring a winner. However, Due to the events that followed, I won’t gratify those issues with a paragraph. I’m so elated! especially that all those who contributed to this win believed it was well deserved. Thank you so much!! 1. PEOPLE CANNOT HELP YOU BEYOND THEIR SCOPE OF INFLUENCE: This was the most important lesson. I have quite a network, but many of them are not Twitter users. Very few are active on social media. So it was a huge challenge getting them to like a tweet or do any sort of social media based voting. No matter how much they loved me or wanted to see me win, they just couldn’t help as much. I was getting a bit dismayed but I was encouraged because of the next point. 2. NEVER UNDERESTIMATE THE EFFECTIVENESS OF CROWD SOURCING: I literally solicited for Retweets and likes. I must have tweeted over a hundred tweets in these past two days asking everyone I know plus their audience to help. Many of my online friends did their best and it helped a bit. However, I was in awe when even strangers took it upon themselves to help me get on. Majority of the support were from their networks. 3. PEOPLE CAN OFFER HELP BUT WOULD RATHER YOU ASK FIRST: Before I started campaigning for likes, I was just sending general messages to everyone. I didn’t think I needed individual summons before my friends and acquaintances would help. To my surprise it didn’t work. People read and unlooked . They continued with their regular online activities and casually ignored my announcements. I had to personally tweet at some before they thought to help. It’s amazing how we humans operate. In that moment I felt so much compassion for those who start “go fund Me” pages. I wasn’t asking for money, I was asking for a like LOL. 4. PEOPLE CANNOT HELP YOU BEYOND THEIR PERSONAL ZEAL FOR SUCCESS: Some actually care but are not as zealous as you expect them to be. They want to see you succeed but would not go out of their comfort zone for your sake. During the contest an acquaintance of mine asked me to give up, that he’d buy the items for me instead LOL. What he didn’t know was that my motivation for winning wasn’t because of the material value of the proceeds, but my personal desire for excellence. I don’t put efforts on things I know I don’t have a chance of excelling at. E.g. I won’t go for a singing contest when I know I can’t sing. I told myself that even if it was even a Pen that was the grand prize, as long as I’ve chosen to participate I must aim for the top. 5. MANAGE YOUR EMOTIONS NO MATTER THE CIRCUMSTANCE: The competition got so heated in the last hours of playing and early hours of announcing a winner. A lot of remarks were made by another contestants “camp”, for lack of a better word. However, This emphasised the benefits of a wholesome life balance & emotional intelligence. No matter how unfairly you think you are treated never ‘FIGHT’ for it. What I mean in this context is ‘do the best you can, gather your resources & facts, but don’t slander’. The moment you begin to go ballistic on the opposition you unconsciously lose the genuineness of your cause, and your personal credibility. No matter the situation, keep your peace. 6. ALWAYS PLAY FAIRLY: This is self-explanatory. In a race you keep running, you never see an athlete pouring water at the feet of his opponents or tickling them for fun as he’s racing on. It’s unnecessary and unwise. Whatever it is you find your hands to do, do well and with all moral conduct. Focus on the prize and forge on. In business there is a term called industry analysis, where you evaluate and monitor your competitors to know how much effort to put in, but never for once try to sabotage anyone by insinuations, words or actions. It breeds unhealthy competition. 7. NEVER GIVE UP: I got tired, my eyes were sore…. but I encouraged my self with each like I got. I got so determined when my best friend from Ukraine and my brothers away in Uni, all stayed up to help me out. They were reaching out to everyone they knew and that motivated me even further. I just knew that I would put in all effort to the best of my abilities and trust for a great outcome. My friend Hannah said to me, “Tosin, win or lose, it’s clear you did your best, and God honours that. Expect great things this week, Out of every situation good can arise”. I believed that, and not only was I announced the winner, yesterday was a fantastic day. I’m so excited about the rest of the week! Did I mention my birthday is in 5 days? I’ve started receiving gifts too ^.^, shout out to Mrs Vivienne who sent me an early birthday gift! Thank you! – It’s such a small world, I reconnected with long-lost acquaintances because of this. Be viral for positive causes. – Trust and have expectations with discretion, many want you to succeed as long as it benefits them or you don’t rise above them. – Always thank people and show gratitude. It’s simple but goes a long way. – Don’t assume others will help because you’ve once helped them. – Success, no matter how insignificant has many friends, failure only has a pity party. I know this post was lengthy. But it’s important I shared. Thank you so much for your support with all my endeavours no matter how inconsequential to you. I love you and may God honour you this season with abundance. Immediately I saw your video on instagram thanking us for liking the tweet after you won, I had an intuition that said Tosin will share lessons from this! That definitely was the holyspirit! So true ooo, another thing I learnt from things like this is that its mostly people you dont really know that will go all out for you. Your close friends not that much or maybe just mine. Am glad you won. Such is life. After God, you alone are responsible for your life at the end of the day. Thank God for the lessons. Lol @ “God will remove the sand in your garri”. Having a great network of supportive people truly counts. I have participated in quite a number of online contests, didn’t take them serious tho but these lessons you listed are so true!! So many times I get sad when my friends don’t do what I expect them to do but I have come to learn that after God, self & family others could careless. Thank you for been so smart, sensitive & yielded to the holy spirit. You inspire young people like me at least I have 5 friends who always rave about your videos & how much of an inspiration you are. God bless you & happy birthday in advance. Very key and true lessons. Congrats once again, dear. I’m just always glad when my ‘little one’ adds to the number, and you win. I believe you may not have all that a person desires, but you can give what you have nevertheless. And I have to say I’m proud of you for keeping your crown on, throughout the brouhaha. Stay queening, LaDiva! You know your birthday will be uber amazing, right? Yes, it will be! Congratulations Tosin and happy birthday in advance. Congratulations, Tosin.You do have a beautiful smile!